You don’t need us to explain why cheese and cider are so great together (so great, in fact, that some cheese makers have even begun washing their cheeses with cider). But, that’s not to say that all cheese and cider pairings are created equal, because they’re not. Playing with texture, flavor, acidity and sweetness, you can take a pairing from tasty to transcendent with a few well-played moves. Here are our tips for creating a seasonal summer cheese board, and a few ciders to think about sipping along with it! Pony up those pennies: When it comes to choosing your cheese, as with most specialty foods, go for the best quality you can afford. 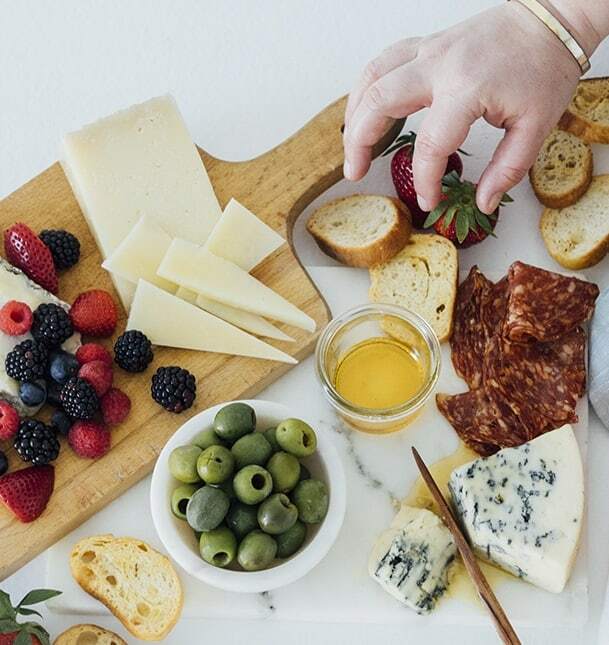 When it comes to a cheese board, quality should trump quantity; instead of a giant hunk of cheese, choose smaller pieces that will really deliver on amazing flavor. Ask for help: A market or shop with cheese-mongers on staff is the right place to start. A well-informed monger can help guide your choices and provide you with samples to try before buying. Curate your curds: Create depth and interest in the cheese board by choosing a few different textures and flavors of cheese. Go for a stinky soft ripened cheese with a sharp, hard aged cheese, or a pungent mold-veined sheep’s milk blue with a mild, buttery cow’s milk melter. A cheese-monger can also help you choose cheeses that will compliment each other without being redundant. Stay seasonal: The heat of summer might not be the right time for overly rich, decadent cheeses. Go for light, clean cheeses, made from the rich milk of animals who’ve enjoyed a few months of grazing on spring grasses. Goat: We live for bloomy, soft-ripened goat cheeses like Cypress Grove’s Humboldt Fog. This creamy, dreamy handcrafted cheese features a distinctive ribbon of edible vegetable ash throughout. Tasting notes include floral, herbaceous and clean citrus. Cow: A smoky, complex blue like Rogue Creamery Caveman Blue, adds a meaty, assertive note to the board. Rogue’s Caveman manages to be rugged and sweet and fruity at the same time, with slight vanilla tones and a buttery texture. Cave-aged for at least six months, this bodacious blue tastes of sweet, fresh buttermilk with tasting notes of beef, bacon, tropical fruit, grass and hay. Sheep: A firm, slightly grainy sheep’s milk cheese rounds out the board. Look for something like the Berkswell from Neal’s Yard or Malvarosa from Murray’s in NYC. A nice Manchego works well, too. Accompaniments: Fresh berries are a must, as is wildflower honey (local, if possible) and a sourdough baguette. For a more substantial plate, add in mild, creamy olives, like Castelvetrano, and a not-too-spicy cured meat, like saucisson sec — we like this one from Olympia Provisions. Cider Pairings: Of course, since it’s summer, rosé cider is probably in your fridge. This style can pair well with cheese, but avoid anything too sweet or with a large list of adjunct flavors. A little funk is welcome, too, so something wild-fermented is preferable, like Pinot N’arlet from Ploughman Ciders. If you like ciders with fruit, reach for something that features a summer-specific fruit, like Virtue Cider’s Michigan Cherry or Reverend Nat’s Hallelujah Hopricot. Want to stick with heritage ciders? 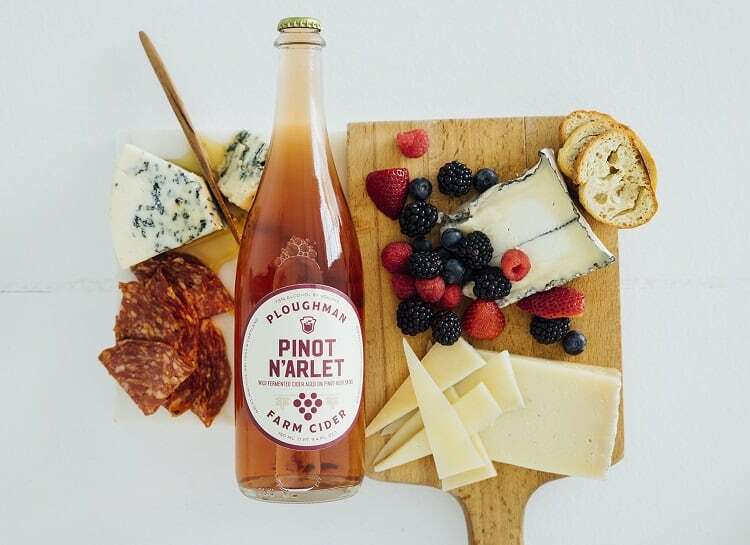 Try something bright, citrusy, and maybe a little wild, like South Hill Cider’s 2015 Sparkling Packbasket, or something a bit more straightforward like Albemarle CiderWorks’ Red Hill. Inspired to use more cider in the kitchen? Check out our cider recipes, and our series of cider and food pairings!